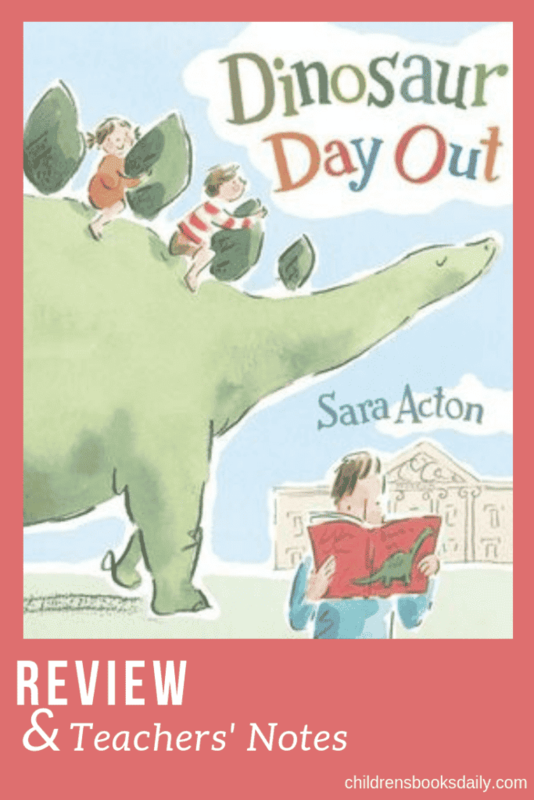 Siblings Sally and Max are off to see the dinosaurs at the museum with their dad! They are most excited about the dinosaur exhibition but when they arrive they find it is closed. 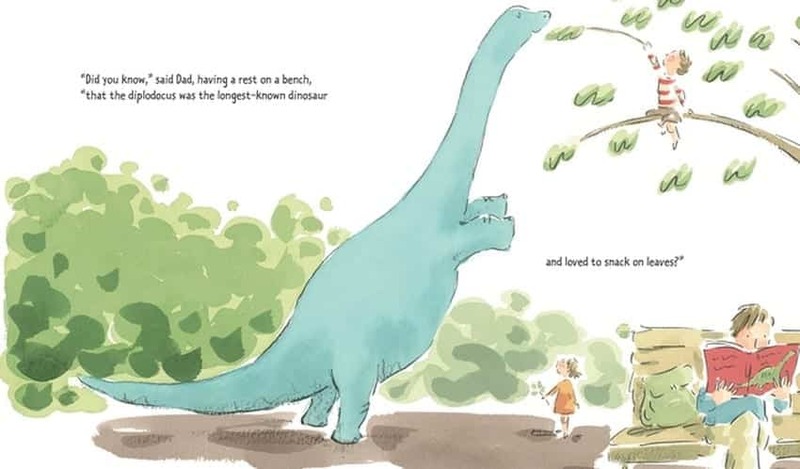 Dad instead buys a book about dinosaurs at the museum shop and off they go on a walk through the city, reading about dinosaurs as they go – the pterodactyl, the stegosaurus and so on goes the list of dinosaurs dad reads about. Dad is so utterly engrossed in the book that he is totally unaware that Sally and Max are seeing those dinosaurs from the book roaming around the city! There’s a fabulous lesson in visual literacy in this book – with the pictures telling a different story to the text. A gorgeous addition to the home or school library for dinosaur lovers of all ages. 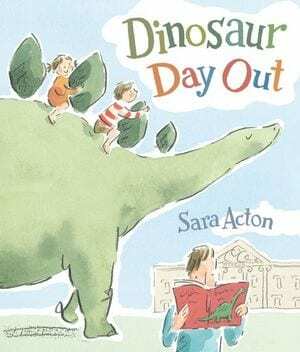 Without showing the cover, tell students the title ‘Dinosaur Day Out’ and ask what they think the book might be about. Discuss. 2. Show the front cover to the students and discuss further. What could the book be about? What kind of dinosaur is on the front cover? What are the children doing? Why do you think so? What is the adult doing? Why do you think so? What is a museum? What kinds of things would you see at a museum? Who has been to one? In the title the word ‘Dinosaur’ is in green and the words ‘Day Out’ are in other colours. Why do you think this has been done this way? Can colours help to represent a word? Discuss some examples of other words that could be written in green to help represent them –peas, broccoli, grass, aliens etc. Open the book flat to display the front and back covers – the illustration is continued onto the back cover. Why as the illustrator done that? Is it to try to show us that dinosaurs are very LARGE? What other large things could be displayed like that to help us understand that they are big? Whales? Bus? Mansion? 3. Read the blurb. Who do you think Sally and Max are? Can you see them on the front cover? Do you think that dinosaurs exist anymore? And where would they go on their day off? 4. Sara Acton is the only name on the front cover. What does that mean? 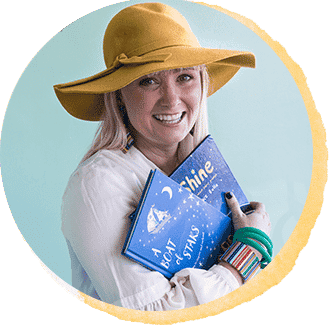 – she is the author and the illustrator. 5. What mediums has Sara Acton used for her illustrations? Pencil, watercolours. 6. Let’s have a look at the endpapers – what dinosaurs do you know? There is one difference between the front endpaper and the back endpaper, what is it? Do you think that the dinosaurs were really walking around? Or do you think that Sally and Max had wonderful imaginations? What makes you think that? What facts did you learn about dinosaurs? Make a list. If fiction books are stories and non-fiction books have facts and information, what type of book do you think this is? 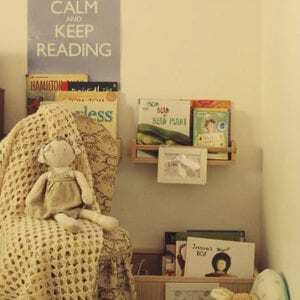 Fiction or non-fiction? For this activity you will need two books – ‘Dinosaur Day Out’ and a non-fiction text on dinosaurs, such as: ‘Steve Parish Amazing Facts: Australian Dinosaurs’, J. Wright, A Cook, S. Hucknell, Pascal Press, 2006 or any other appropriate book you may have. You could even continue this with a worksheet like this, done together as a class (on a whiteboard) or individually/ small groups to help you tease it out more. Now, compare this to the non-fiction book on dinosaurs that you have selected. You will not be required to read this book from front cover to back! Just small parts of it. Print out this Non-Fiction text features grid and cut into cards (laminate if you like). Place Blu-Tak on the back of the cards. You could photocopy pages of the Non-Fiction text which display the text features from the link and display them on a board (depending on copyright). Or you could just use the book and turn pages to find the appropriate features. Place the cards in your hand face down and choose a student to take a card. 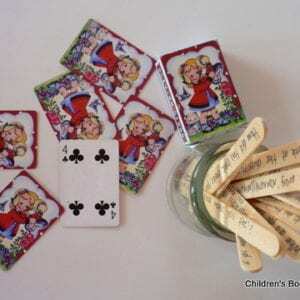 They read out the card then find the page in the book or on the display with the text feature and stick it next to it. Continue for all cards. Promote discussion along the way.